I know there is the common perception that setting up a compound bow is not easy. Putting all the components together is easy? No compound bow is easy to assemble. I use to agree with that assessment but I don’t anymore. ​I have written this article on “How to Set Up A Compound Bow.” To show any hunter of any skill level that setting up a compound﻿﻿ bow isn’t difficult at all. 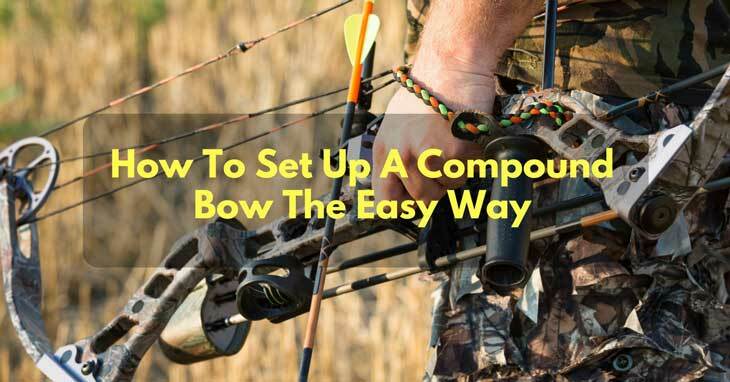 You will learn as I did these easy steps on how to put your compound bow together quickly! We will take this journey together step by step. These are the necessary parts for any compound bow. They have been listed to assist the reader in identifying the different components of the bow. All these parts aren’t critical to the set-up of the compound bow. But all these working parts must be present to successfully set up a bow so it will be in top working condition. In this step, you don’t want to touch the brace height or string length. If you do touch either of these adjustments, they will be out of the manufacturer’s parameters. You will then void any warranties and you will alter the bow’s draw length and bow mass ranges. By doing this you may permanently change the performance of your compound bow. I have found on newer bows when I alternate the bow mass the draw pull isn’t influenced. But with the older bows when you alternate the bow mass the ﻿﻿draw pul﻿l is affected too. Conversely, alter the draw pull and the bow mass will be altered too. To adjust the bow’s mass and your bow’s tiller you take the tool (see above in the tool list which key you use for this adjustment) and screw the arm upward or downward. Screw the limb “up” and the compound bow mass increases. Screw the limb “down” and the compound bow mass decreases. So set the bow mass to a comfortable setting. Bows will perform the best when they are established at the highest bow mass. You will find this out in the field. Setting your bow's tiller measurement is simple. This measurement tells you the weight differential between the upper/lower limbs. Ideally, you want to set the measurement to “zero”. You may do this by hand. Be careful when setting this measurement. There are three adjustment markings on the compound bow. If you change any of the settings all of them will change. Make deliberate adjustments. Once you rotate it to the lowest point you will be able to change the other settings. Be careful making these adjustments. Only make adjustments you absolutely need to make. Rigid : This rest has a blade. The blade has minute downward spring actions. This type of rest is used by the most skilled archers. There is a problem with this type of rest. When the end of the arrow moves past the rest, it may strike the rest. This could cause clearance problems. Be careful when you move the arrow past it. Spring : I like this rest the best. It’s straight and to the point to set it accurately. There is an extension loaded with a spring. It moves downward. It may have the same type of clearance problems as the rigid rest. Falls Vertically : The bow is drawn and then the rest “falls vertically” as the arrow moves. The arrow then has a straight route for flight. If it falls vertically prematurely the arrows will be low flying. There are two methods to operating arrow rests. They are “Shoot Through" and “Shoot Over”. The “Spring” rest allows for either of these methods to be used. Shoot Through : This method may have two arms on the arrow rest. The arrow sits between the arms. Move the “index” fletch down. This must be done when the arrow is nocked on the bowstring. Shoot Over : The index fletch is up. Again, this should be done when the arrow is nocked on the string. This will allow for fletch clearance as the arrow flies through the rest. I would make your mark on the inner part of each arm when it exits the riser. Be careful measuring to determine the central point of the arm. Next, identify the area on your tape with a pen where the central point of the arm should be. Your next step will be to measure the limbs to determine their centers. Measure the tops and bottoms of each corresponding limb. Determine the differential between the central point of the arm and the central point of your bow string. The difference is usually 3/16” between the two centers. Mark the differential. This mark will be your “Even Arm mark”. I like to stand my bow up and support it with a long stabilizer. I will set the bow in a vertical direction so my arrow is connected to my bow string and arrow rest. Station yourself in line with the arrow and line up the string with the even arm centered marks. The shaft part and point part must line up.Your rest and arrow should line up to the string. Once you center it to the string; the rest is now properly fitted with the bow string. Go ahead and place a “bow square” where you need to. Next, put the nocking points so they are even to the rest or slightly above the square. Always use top and bottom nocking points for the above procedure. My compound bow has a guard for the cable. These are adjustable so make sure the arrow has good clearance as it flies forward. Position the guard so there not too much pressure on the cables. These cable guards are fitted either on the lower half of the riser or more commonly on the upper half of the riser. This riser placement is found on compound bows. You should always follow the manufacturer’s instructions on adjusting the bow’s pull. Some compound bows com with draw lengths that can only be adjusted with different sized cams. This will be pricey. You should always know the size of the bow’s pull if you buy a bow that requires different sized cams to adjust it. Fold the string in the middle. Taking pressure from the string to accomplish the above step. You may able to skip the bow press step. Pull the bow to the anchor point. Moving the peep either upward or downward. Move it so everything is aligned within the sight. Attach the bow peep to the string by securing knots on both sides of the peep. Never secure the string around the center of the peep. If you do this alterations cannot be made. Then you won’t see the peep when you fully draw the bow string. This is a critical step. Now, remove the tension from the bow. Take a cable off the wheel. Now remove or add wire twists to the cables. Put the cable back on the cam or wheel. Take the tension off the bow again. Now, check your timing of the cams. If the adjustment was done correctly both cams should reach full draw at the same time. You can start this process by putting the scope on the sight. Next, set the first axis. Put your bow on a level place. Get your builder’s string level and put it on the string. Now move any of the bow risers until the string is even. Don’t pick up your bow. Remove the builder’s string level. Put the string on the bar sideways. Pop out the screws that are in the extension bar attached to the side bar. Adjust the bars until they are level then re-tighten the extension bar screws. Now the second axis. This is a pretty easy step. Adjust the bubble so it’s even with the sight bar and bow string. Now, let’s tackle the third axle. First, increase the sight 30 degrees. Decrease it 30 degrees. The bubble should be level If not you will have to make changes so the bubble is at the center of the third axis. I have endeavored to outline how to set up a compound bow in this article. These steps have helped me keep my compound bows in top shape over the years. Take these steps and apply them to your own compound bow equipment. I think you will get years of experience out of your compound bows as well. Thank you for reading the article. If you have enjoyed reading this article share it with all your friends and family. Invite your hunting friends to read it as well. Please leave any comments you have about this article.